My husband loves Italy. He has opened that world to me and now I love it too. We joke about the fact that I don't see enough horses when we go there. Lots of wonderful olive groves and vineyards stretching to the horizon, but not a lot of horses. 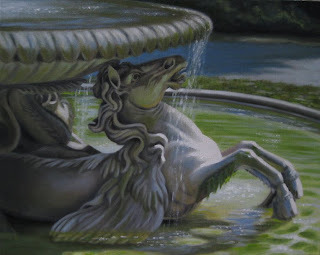 So, I found inspiration in the beautiful horses in the fountains of Rome. I plan on another painting of the Trevi fountain soon, but this year I finished a painting of one of the fountains in the Villa Borghese Park. The sparkling Italian sun on the water trickling over the edge was beautiful to me and I loved the colors that reflected all over the gray stone sculpture. 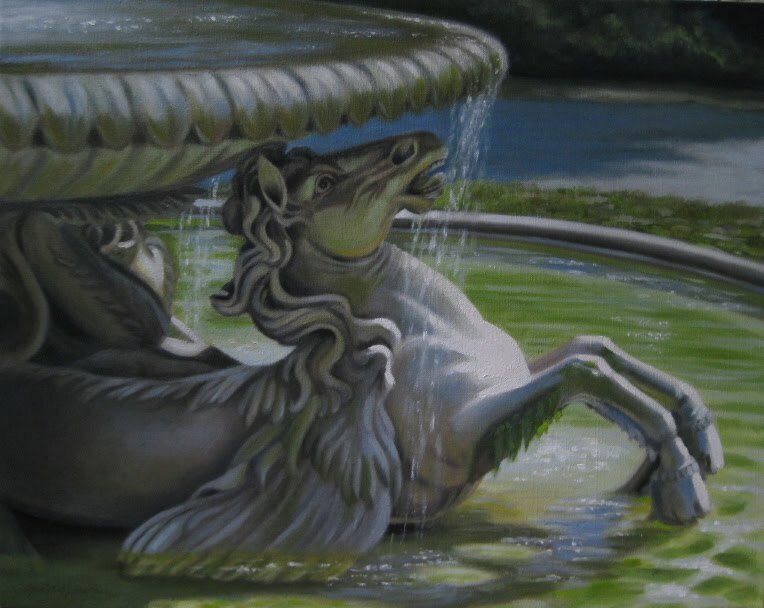 I couldn't wait to paint it and so here it is...."the Fountain of the Sea Horses". From time to time I'll post a small painting that I don't normally post on my website. In the future I may make a website page for small works, but until then...here's an example of my latest, entitled "Lucky Saddle". It is a 5 x 7 . 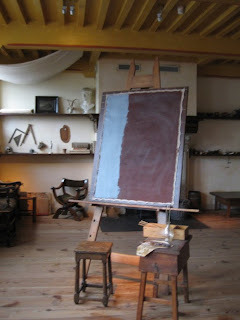 My small works often are studies for larger paintings. Some turn out to be little gems in and of themselves. Good thing is, they are affordable original oil paintings that fit into many budgets, especially in these days of the economic pinch. The next one is "Jockey Study" also a 5 x 7. 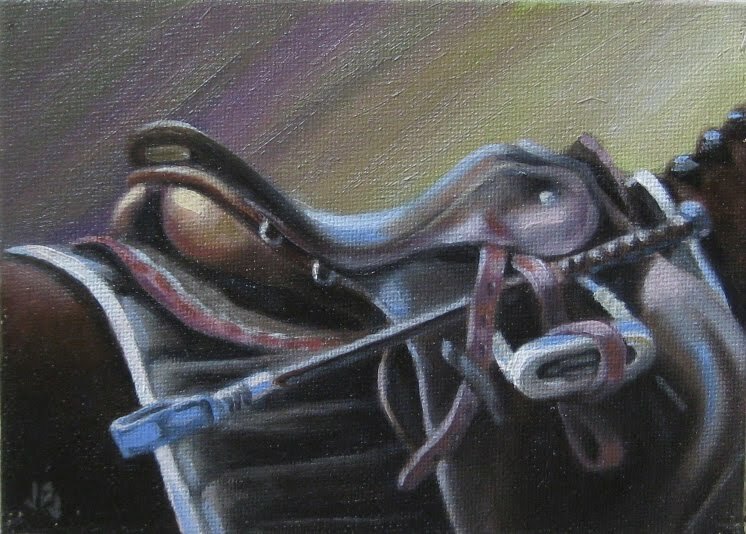 The third is sold, entitled "Mini Amigos", 5 x 7. Contact me at jpj@lakehillstudio.com if you are interested in prices. Just put "small works inquiry" in the email title. Had a great time this week doing some studies of wolves. After painting a few smaller studies I came up with this 8 x 10 called "Edge of The Woods". 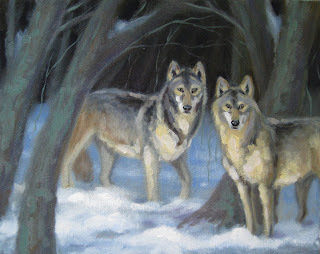 I think I'd like to do a larger much more detailed painting of wolves sometime soon...they are really beautiful animals with the greys,warm browns and whites, not to mention gorgeous eyes! 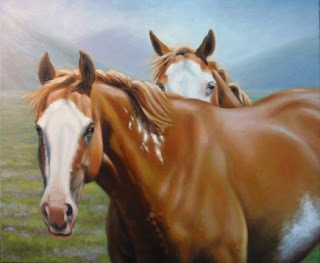 Back to my horses next week....a dressage painting is calling my name. This horse seemed dressed appropriately for the 4th of July Closing weekend at Churchill Downs. My family all made the three hour drive to Louisville for a day at the races. No , I didn't win anything.....but that hardly matters because the photo ops were fantastic. We all had a great day full of a lot of laughs and beautiful horses. We were happy to have the chance to see Calvin Borel that day and my impression of him as being a genuinely nice person is only reinforced after seeing him interact with his fans after the races. When the day was done and he wasn't in a hurry to get on to preparing for the next race, he stopped and gave all of his goggles to some kids awaiting a chance for an autograph..... they were thrilled. It was just one of those great days all around. Here's "You Go First"...the last painting that I finished a few weeks ago. These two Montana paint horses were happily grazing away near Anaconda, Montana last summer when I interrupted their privacy with my skulking around the fence line. Hubby was endlessly finding places to pull the car over every time I spotted horses grazing in that beautiful Montana scenery. I'd never been out there until last summer when we made a whirlwind trip to a friend's wedding. It was incredible. I totally understand why people fall in love with the west. We live in a beautiful country and to travel around experiencing the nuances of all the regions.....it's a blessing. party is on Saturday evening June 6th and the show continues on Sunday 2 p.m. thru 6 p.m.
call 931-858-2228 for ticket information. I am so glad to have gotten the chance to go up to Lexington this past weekend to revel in the wonderful world that is the Rolex CCI**** Kentucky 3 day event ! I almost missed going this year and I know that I just can't let that happen again. Seeing the olympic caliber horses and riders who you know have worked so hard to make it to this level of the sport...it's just exhilarating to say the least. Following the Eventing USA blog has helped me keep up with who was going to be competing this year...and only added to the excitement and anticipation. 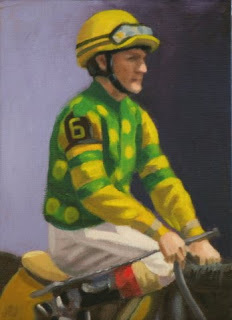 The photo that I posted here is of Syd Kent, ridden by Jan Byyny from the USA. I certainly filled up my flash cards full of references for future artwork for sure. Each year my photography skills get just a little better and more and more of the photos are keepers. I never claimed to be a sports photographer, I really have to respect the work that those people do! I work from my own reference shots and so between all of them...I can get the info that I need. My husband went with me for the first time and he was enthusiastic learning about the sport. To see him also appreciate something that I feel so passionate about warmed my heart :-). We had a great time enjoying the crystal clear spring days. 364 days and counting until next year's Rolex....... :-) :-). This weekend will be my second year exhibiting with the Art in Bloom Fine Art Sale & Show presented by the Junior Service League of Gallatin, Tn. This show is a fundraiser in support of charities supporting the women and children of the community. It will be held at the Bluegrass Yacht and Country Club at 550 Johnny Cash Parkway in Hendersonville. The Preview Party is on Friday March 27th from 6:30 p.m (reservations required...call Cindi Givens at 615-452-1431 for tickets). The show is open to the public on Saturday, March 28th from 10:00 a.m. until 4:00 p.m. Although I have about 7 larger equine themed paintings in process in my studio right now....I concentrated on including smaller works for this show. I've included a sneak peak of a few of my 5 x 7 studies that I'll have at the show this year. The first is a 5 x 7 ,"Gray Hunter Study". The second is a 5 x 7, "The Hunt is on". 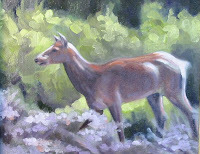 The third is an 8 x 10,"Female Elk, Yellowtone study"
It's spring in full swing here in Tennessee and hopefully our community will be out and about and ready to see all kinds of artwork from over 40 artists. Stop by and say hello at Art in Bloom ! Good news ! 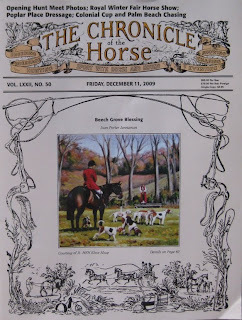 I was thrilled to find out this weekend that I have been awarded an honorable mention for my painting "Beech Grove Blessing" in the 2009 Horses in Art magazine's cover contest. Knowing the volume of entries that they receive, I'm happy and honored with this recognition. They'll be following up with an editorial in a future edition. This painting was done from a combination of my references shot while attending the BGH's opening hunt. 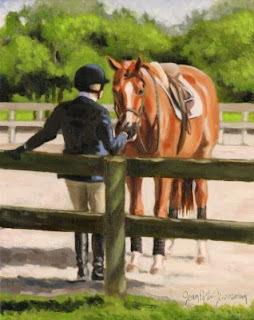 The jt MFH is Elese Alsup who is pictured here on her beautiful bay thoroughbred "JB". They make quite a team for sure. The blessing of the hounds, horses and riders is a tradition of the opening day of the hunt season. 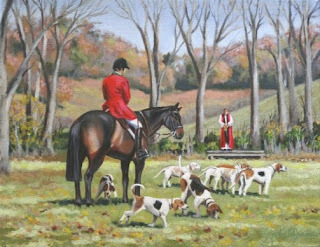 I have become fascinated with the entire fox hunting tradition and love painting the subject. My younger days were filled with riding in junior hunter shows and training for eventing, etc. but I never had the opportunity to ride with a hunt. I'm not entirely sure I would have had the nerve required anyway.....but that's beside the point! Experiencing all the tradition, excitement and atmosphere of the hunt is exhilarating even if it is from the outside looking in. I really appreciate Beech Grove Hunt's willingness to allow me to visit and learn from everyone. They are patient with my endless questions and reference shots. A few years ago, the Masters of the Foxhounds Assoc. 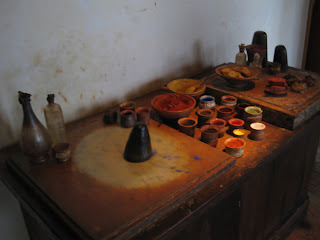 had its centennial traveling art show and I was proud to be one of the artists included. 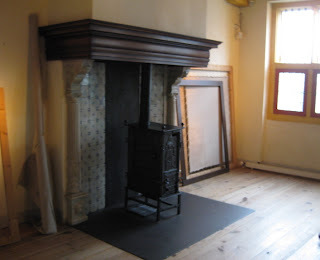 To encourage artists to consider the subject, the MFHA urged it's members to open up opportunities for artists to experience the hunt and the members of BGH were willing to do just that very thing! I look forward to many fox hunt-themed paintings to come.